Your contribution makes access to health insurance affordable for people in Africa. The program in the Nigerian state Kwara is a good example of this. Health insurance brings health care within reach for low-income people. 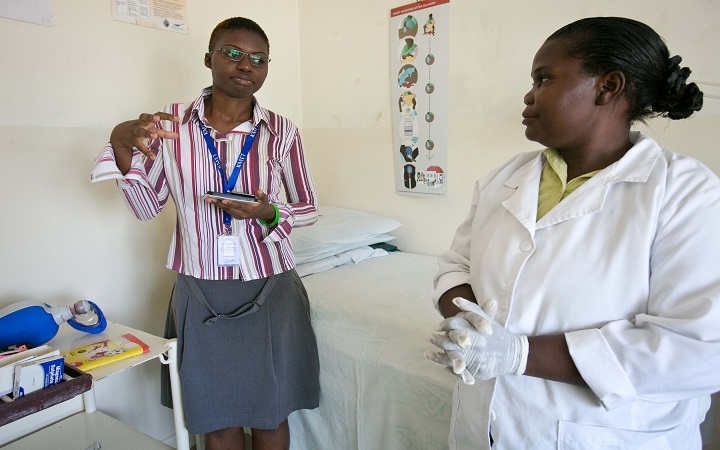 Ensuring the quality of that health care is one of the biggest challenges in Africa. Due to insufficient assistance at birth, compromised hygiene and poorly trained staff, Africa has the highest mother and child mortality in the world. Together with our partners, we have proven that access to quality health care is possible in Africa. Eze Mshelia is a teacher who lives with her husband and four children in Kwara state in Nigeria. For the past two years, they have had health insurance through a program run by the Health Insurance Fund. 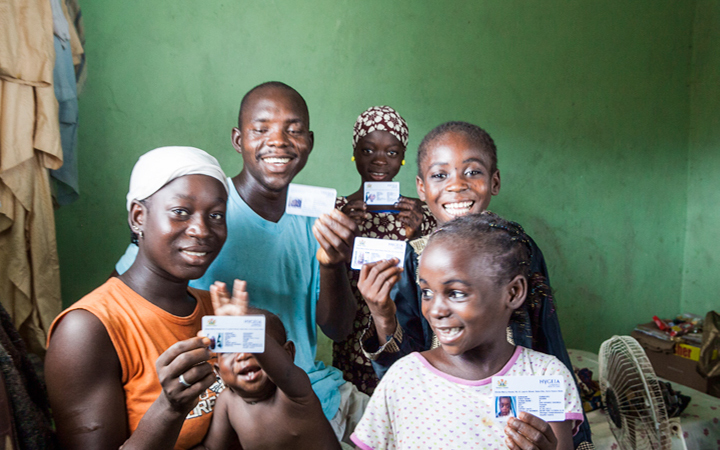 Their health insurance card represents the fact that Eze and her family have access to quality health care. It means they know that if their youngest child contracts malaria she will receive quality medical treatment, and if their oldest daughter becomes pregnant, she can count on quality health care throughout her pregnancy. More than 110,000 people have enrolled in the program, and the quality of health care has improved throughout the entire state of Kwara. Your contribution to Global Health Membership supports the programs of the Health Insurance Fund. Among other things, it makes health insurance affordable for people in Africa, so that they, too, can count on quality health care when they need it. Let’s take a closer look at, for example, our program in the Nigerian state Kwara. In collaboration with the local insurer and local government, the Health Insurance Fund is improving access to quality health care for the population of three local government areas of Kwara – primarily farmers. The program is clearly successful, as over 110,000 people are now insured. The fifteen participating clinics have made huge quality improvements and scientific research shows that the people in this insurance scheme are also considerably healthier. When people have insurance, they see a doctor earlier and more often (healthcare utilization up by 70%). Since the start of the program, people are receiving treatment sooner and are more educated about their own state of health. The Governor of Kwara sees the success of the program and wishes to extend it across the entire state. The goal is to have 600,000 people insured by 2017. As one of the poorest states in Nigeria, Kwara cannot realize this goal on its own. With your contribution, however, this vision may well become a reality. Together with the Governor, we can make sure that health insurance becomes an affordable option for families in Kwara, and that quality health care becomes available throughout the state. This is a unique cooperation on the African continent. For example, take shopkeeper Aishatu Atahiru. This 34-year-old mother of two lives in Kwara. During the last term of her second pregnancy, she was told that her baby was in a breech position: an extremely dangerous health situation for both mother and child in rural Nigeria. Luckily, Aishatu’s health insurance card gave her access to a clinic with trained doctors, where she gave birth to a healthy son. She was so grateful that she named her son after the local healthcare center. Hygeia is now five years old and sometimes helps out in his mother’s nut shop. Together, they are building a healthy future. Health insurance is one way to give people access to care. At the same time, providing access to care, let alone quality care, is one of the biggest challenges in Africa. The government hospital services are overextended and there is a shortage of proper equipment and trained medical staff. To address these challenges in Africa, Global Health Membership employs the internationally accredited SafeCare standards. SafeCare supports basic healthcare providers in resource-restricted settings to improve the quality of their services by working through a stepwise, structured quality improvement program. The SafeCare standards were developed by PharmAccess in cooperation with two international accreditation organizations. They measure and improve the level of quality of the medical care in small clinics and hospitals all over Africa. The program assists doctors and healthcare providers in raising the standards of their services and operations. Through trainings and improvement plans, SafeCare helps healthcare facilities to make their medical services better and safer, step by step. In the last two years alone, over 900 clinics in four countries have improved their services with this step-by-step method. Every month, these clincs receive over 700,000 patient visits. What’s more, four African governments are looking to adopt SafeCare as their national quality assurance program. For example, take Dr. Hassan Ahmad, owner of a small clinic in Tanzania called Bonde Dispensary. After joining the SafeCare program he made substantial improvements to the entire clinic. In order to bring hygiene levels up to standard, he tiled the floor and walls of the whole clinic and installed running water in all rooms for hand washing. He also brought the laboratory and pharmacy up to scratch and arranged separate examination rooms. These changes led to a huge improvement in his healthcare services. And more patients! As part of the health care and quality improvement programs, Global Health Membership is supporting improvements in mother and child care. Due to insufficient assistance at birth, compromised hygiene in hospitals and poorly trained midwives and doctors, Africa has the highest percentage of mother and child mortality in the world. As diseases like malaria abound, babies and young children remain vulnerable. Many never celebrate their fifth birthday. Global Health Membership supports programs that tackle these unnecessary losses. Health Insurance Fund’s programs are geared towards providing pregnant women with quality medical care before, during and after the birth of their child. Follow-up and health checks for malaria and more. It’s proven to be a great success. The program has trained more than 1,000 people, enabling them to provide quality care for almost 40,000 childbirth deliveries. Over 80,000 cases of malaria have been detected and treated on time. In addition, pregnant women came in for, on average, five antenatal visits per pregnancy. For example, take 25-year-old Emily. She gave birth to healthy baby son Leon in Milimani Hospital in the east of Kenya last summer. This small hospital made many investments in recent years to improve its quality of care. 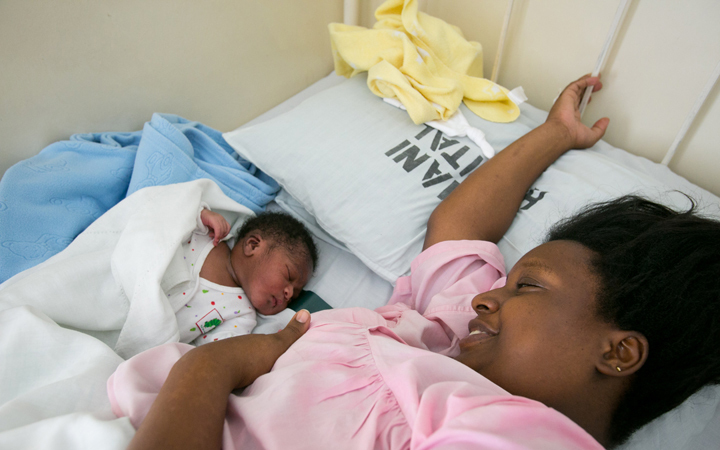 As well as training its staff, they improved their birthing room and chambers, and expanded the number of beds. Milimani also purchased a new industrial laundry machine to ensure there are always clean sheets. Thanks to all these innovations, Emily was in good hands and could spend the first few days getting back her strength with Leon in a clean bed in one of the new rooms of the hospital.